The 22-year old Tramore golfer indicated some time ago he would be turning professional following his appearance in the Ireland Home International side and with Ireland, who had lead after both the first and second days, overhauled by England by just half-a-point in a dramatic closing encouter earlier today at Conwy Golf Club. Dawson will travel to The Algarve to join fellow Irish Padraig Harrington, Shane Lowry and Paul Dunne teeing-up next Thursday on the Dom Pedro Victoria course at Villamoura. 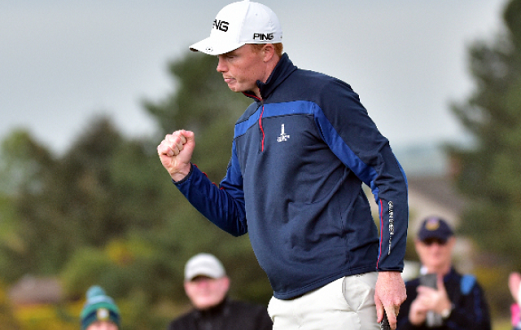 And the flame-haired Dawson will be in good company with Harrington (2016) and Lowry (2011) past winners of the event. Though Dawson will be wise not to get involved in a game of ‘Credit Card Challenge’ with his professional compatriots in heading out to dinner as Dunne found out a few years back in Vilamoura when Harrington remarked as the bill arrived: “Well Paul? It’s time for a game of credit card roulette’. Dawson, who earlier this year captured the Irish Amateur Open, is among six players to be afforded an invitation including 2017 Masters champion, Sergio Garcia, who like Dawson, will also be making his debut in the Portugal event.